Back in the mid-1980s, Photon: the Ultimate Game on Planet Earth was a fascinating new spin on paint ball wars. 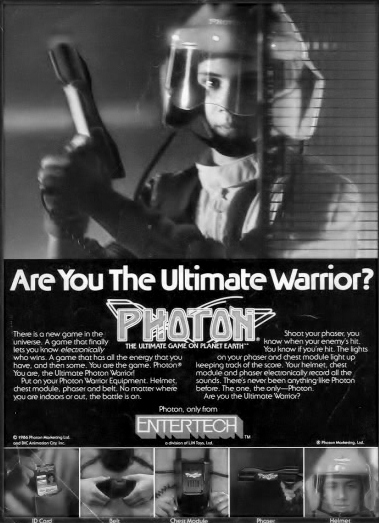 Created by George Carter (who was reportedly inspired by the battles in Star Wars), Photon was a laser-tag-styled game that, at its peak in 1987, boasted some forty-five “game” arenas across the continental United States. Essentially, you’d go to a Photon arena, pick a handle or nickname for yourself (like mine, “Ash”), join a red or green team, and then put on something like twenty pounds of heavy equipment, including a chest-plate and a helmet. And, of course, you’d be given a laser pistol. 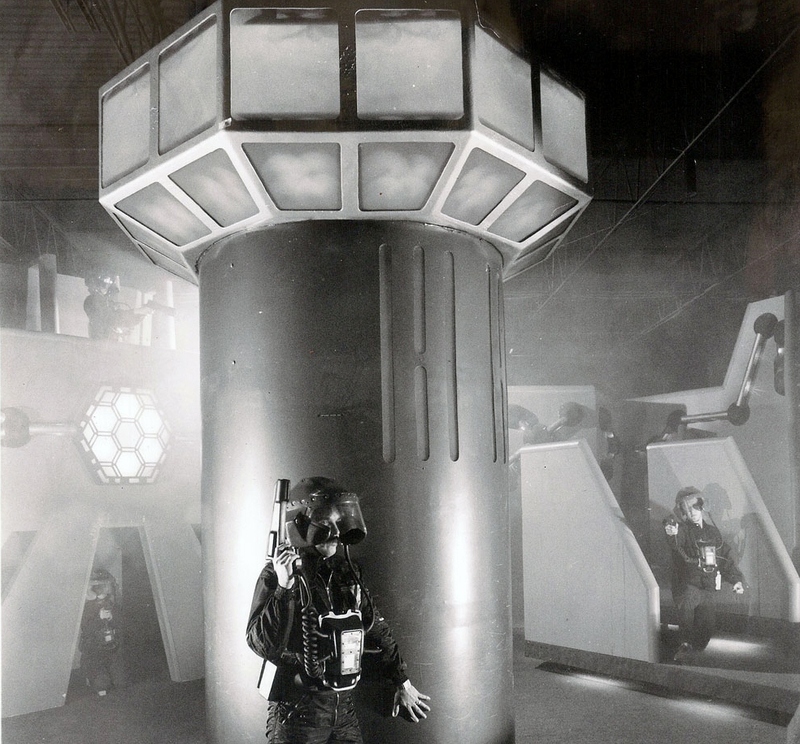 Then, for five-or-six minute intervals, you’d be let loose onto the multi-leveled high-tech battleground arena, which featured catwalks, mazes, smokes, strobe lights and other fun atmospherics. There was even an observation deck overlooking the arena where you could get a good lay of the land. The goal, naturally, was to stay alive and to shoot down your enemies on the opposing team. Your hits were “tagged” on the chest receivers, and if you got zapped, your gun went inactive for a short interval. Photon: the Ultimate Game on Planet Earth ignited a laser-tag mini-fad in the mid-1980s. 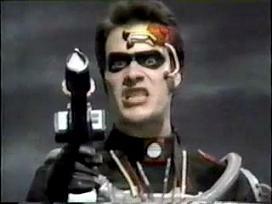 A line of Photon books was published, with titles such as “High Stakes” and “For the Glory,” and DIC Entertainment produced an authentically weird Photon syndicated live-action TV series about the “Guardians of the light of Photon” and starring a lead character named Bhodi Li (Christopher Lockwood). The series plot was something akin to The Last Starfighter, with the greatest Photon warriors battling a warlord named Arr, if memory serves. I never reeally got into the ancillary stuff (toys, books or TV show), but during my senior year in high school, I organized a Friday night trip to a nearby Photon arena as class president. It was completely awesome, although I remember one of my friends was alarmed that he couldn’t have the handle “God” as his nickname. I can’t remember how much it cost to play Photon, but the game play was pretty terrific. It was also exhausting. Carrying around all that heavy equipment quickly grew tiring. Then, just a few short weeks after that first awesome visit, I decided to go back to Photon with a group of friends to relive the experience…and the arena was gone. I mean the place was literally gone…like the Borg had scooped it up off the Earth. Baffled, my buddies and I went to a nearby furniture store to ask what had happened to Photon, and the employees thought we were asking for a “futon.” Urgh. We went bowling instead, and so ended the Photon phenomenon. Photon: The Ultimate Game on Planet Earth died quickly, but to kids like me in the 1980s, it also burned brightly. In fact, last decade, by my understanding, a new Photon arena opened in Broken Bow, Oklahoma, though it too is now defunct. This entry was posted in Memory Bank, Photon. Bookmark the permalink. One summer in college, I was addicted to LaserQuest, which opened its (I think) first US site in Lexington, KY. Once married, I didn't play much. When Number One Son got old enough, I took him, and he loved it too.Then the developer kicked them out of the building, and turned the place into condos. Lexington wasn't a big enough market for them to rebuild somewhere else, so they just closed. Number One Son wanted to picket the condos, but I pointed out that they weren't involved.The local skating rink finally opened a different laser tag site, but the equipment just isn't as good. Oh man, Photon. Everyone hated the older kid who named himself Stealth. That guy was a master, tore us all up on a regular basis. After it closed, I think it became a Whirly Ball place.